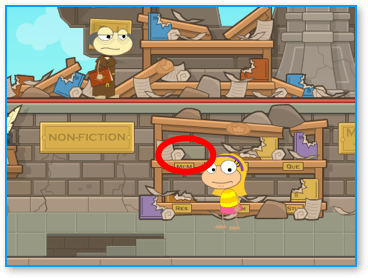 If you would like to help out with pictures, send them to poptropicainsideandout@gmail.com! You’ll arrive by a balloon in Arturus. When you land, the first building you will see is the House of Mordred, although it’s now called Mordred’s Museum. It was once occupied by a powerful and mysterious sorcerer named Mordred and it contains a number of things that he used while he lived here. Next to the house is a large fountain with a spaceship statue in it and the statue and fountain are dedicated to Mordred for bringing technology to the kingdom. The remaining two buildings are the planetarium and the Crop Circle Inn. This final building is a multiplayer room where you can battle other players and chat. Proceed immediately to the fountain. In the water near the base of the spaceship you will see something sparking and shiny. Jump up to get it and you will discover that it is a coin. It will go into your backpack. Now go back to the first building, the House of Mordred. Talk to the man you see when you enter and get the pamphlet. Then use the coin in your backpack and he will tell you that you are free to look around. Next, click on one of the books. The guy will ask you not to touch them, but will give you a library slip. This library slip is a clue to a hidden area. Pay attention to the underlined parts: McM. Next, go outside and run all the way to the right to the end of the area. Pass through the short road and go right again. You will arrive at the Castle of Arturus. Walk to the right and then go through the large double wooden door. Now go to the right and enter the small wooden door. You will be inside the castle library. There are two books to get. To pick them up, just walk over them. One is a green book on the far left side of the room in the Fiction section. It is called,Mystical Weapons of Arturus. The second book is The Life of Mordred – A Cautionary Tale. It is down the stairs in the non-fiction section on a book stand. After you get the second book, look at the nameplates on the shelves. One is labeled McM, just like the underlined section of thelibrary book slip you got earlier. Click on the brick behind the nameplate and a secret staircase in the floor will open up. Go down the stairs and you will arrive in an underground room. Walk over the moldy cheese on a plate right near the entrance. Then walk a little farther to the right and click on the wooden handle on the wall. This will open up a small grate near the ground over to the right, but not the one between you and the robot in the cell. Click on the robot and he will say some long binary numbers (all 1′s and 0′s). This can be translated and the correct way to translate it is “bard”. Go back up the stairs. When you return to the library, the librarian is there with two guards and is unhappy with you for snooping around. Run out the library and return to the main part of the castle. Go to the left and then enter the door by the staircase. There is a robot mouse on the ground and a very unhappy girl here. Go to your backpack and use the moldy cheese. The robot mouse will go for the cheese and then you will capture him. Now go to the right and jump up on the chest next to the bed. There is a letter on it. It is a secret message that says, We must change our password! I feel my parents will find out what we are doing and put an end to it! Talk to the hooded guy near the entrance and he will give you a Bag of Manure (gross!). Then jump over the two hay bales and run up the hill to the door for Ye Olde Rumour Mille. Go inside. Now walk to the left and jump up on the hay bales. Then jump on the shelf and then up onto the gears and cogs. When you get near the top, jump to the right to land on a small platform in the middle. You will see a piece of rope hanging to the right. Jump onto this rope and this will lift the wooden rod so that it is no longer attached to the gears. Slide down the rope and you will land on a platform next to a very pale dark-haired girl. Click on her. She will ask to trade secrets, and will take the secret message you found in the castle. In return, she will give you a piece of paper with three cosmic symbols on it. It is the new password for the Secret Order. Jump down off the platform and go outside. To the right of the mill is the big wheel in the mud. On top of that wheel is a coil of rope. Jump up on the wheel to get the rope. Now walk over to the left and stand underneath the Ye Olde Rumour Mille sign. Jump on the sign and then jump up on top of one of the windmill blades to get it to start spinning. Keep moving around and jumping on the blades to spin them around until the little glass bubble on the roof is completely open. When it is open, go inside it. Inside the windmill you will find a broken hover craft. It needs something to power it. Fortunately, you have something. Open up your backpack and Use the bag of manure. The hover craft will fly out of the roof and land in the mud outside. Go back out of the ceiling to leave the windmill. Before you use the hover craft, though, there’s work to be done back at the castle. OK, head back to the castle and then stand in front of the large oak door. Jump up onto the windowsill and then jump onto the platform with a large bow and arrow on it. Then go to your backpack and select Use on the coil of rope. The rope will be attached to the arrow. Now point the arrow in about a 45 degree angle to the left and click to shoot the arrow and rope. If you aimed correctly, the arrow will stick into the door of a nearby tower. Now walk across the rope and enter the door in the tower. Once you have the paper in your backpack, head back outside of the tower and then go left until you reach the fountain in the middle of the square. Now that you’re back near the fountain, walk into the middle of it and click on the plaque on the wall that has the space symbols. Select the symbols in this order: Crescent Moon, Planet with Rings, 5-pointed star. Then click on the large Sun in the middle. A secret door will open and the water will drain out of the fountain. Go inside the entrance. You’ve found a secret order. There are several people here wearing purple robes. Walk to the right and talk to the boy with buck teeth and pimples. He will give you a small key. Now get back on the rope and head out of this secret room. Leave the museum and go back to the guy with the shovel who gave you the manure. Next to him are two bales of hay. Push them all the way to the right and then jump on top and stand between them. You should fall down to the ground. Then push the left bale back to the left side and you will reveal a secret locked trap door in the ground. Use the small key in your backpack to open it and go down. Slide down the rope and then walk up to the mechanical owl. It will fly outside. Go back up the rope to follow the owl. Release the mechanical mouse from your backpack and the owl will fly down and eat it. CHOMP! Now the owl will be your friend and follow you around. If you click on the owl you can tell it where to fly. Go back down the trap door and then walk left. Pick up the book that is sitting on the chair. This is Mordred’s Journal. Then walk all the way to the left and keep pushing against the wall. After a few seconds it will crumble into pieces. Go all the way to the left and you will see a small hole. Go through it to enter the cell where you found the robot. He will self-destruct and a fuel rod will fly to the left beyond the bars. You can’t reach it by yourself, but your new friend the owl can! Click on the owl and then click on the green rod and the owl will retrieve it for you. Click on the owl and then click on yourself and your owl will give you the rod. Go back through the hole and exit the secret hideout. Go to the right until you get to the windmill and you will see the hover craft that you found earlier. Jump onto the hovercraft and head to the right. You will find a spacecraft named Exaclibur. Click on the spacecraft and you will see a control panel. Drag the green fuel rod in the bottom left corner to the bottom right corner where you see a broken one that is dripping. Then enter the coordinates for the moon that you found earlier. They are 56-52. You enter the coordinates by spinning the two dials on the right. Once you’ve done that, press the red Launch button to take off! Your new spaceship will run out of fuel and crash-land on the nearby moon. Go to the right and jump on the platform in the middle of the Astrozone building and then go inside. Talk to the guy on the left. Ask him how to get off this planet. He’ll tell you to leave your ship for scrap and then build a new one on the holopad. Go outside and click on the Holopad machine to the left. There’s a big sign over it that says,Build Your Own Rocket Here. You can design your own rocket anyway you like. The most important thing is to balance your speed and shield. It will probably help to have a little more speed than shield, but you can probably survive the other way too. When you like your ship, click on the Done button and your rocket ship will be waiting for you on the launch pad nearby. Enter your new rocket ship to continue your adventure. Click on launch to take off into space. There are three planets to visit and you can do them in whatever order you like. To fly the ship, just move your mouse cursor around. You can shoot your weapon by clicking. Pay attention to the coordinates in the bottom left. When you get into alien space, watch out because other ships may start to attack you. The coordinates for Jungle Planet are 15,15. When you get near, an alien ship will start attacking you, so click on the planet as soon as you can. Once you arrive on land, exit your ship onto a platform and then drop all the way down onto the ground. Walk to the right and you will see a small platform with a weapon in a spotlight. Walk over to it to pick it up and put it into your backpack. It is a laser lance and it can release a destructive burst of energy when fully charged. Next go to the left and jump on top of one of the flowers. They will catapult you into the air. Keep jumping until you reach your spaceship again. Up above you is a little green bug with yellow electrical charges shooting between his arms. The will zap you if you get too close. Watch for the swinging pendulum to your right and jump on it as it’s moving away from you (so that you don’t get zapped). Wait for the platform you’re on to go all the way to the right and then start swinging back. Then jump and you will land safely on the next platform. Keep doing this until you get ot a platform on the right and then jump off it. It might take a few tries to get this right. When you’re on the platform, go all the way to the right. Next, you’ll find a knight in green armor. He is Sir Cador and he has failed in his rescue of the princess and he will tell you that you should try to get into the cage to rescue the princess. Click up the rope and then wait for the first egg to open. Then jump and if you timed it well, you will land on the egg when it closes again. Wait here until the next egg is open and then jump again. On this egg, jump immediately because it opens again very quickly. Jump onto the next egg and then jump onto the cage with a winged unicorn inside. Click on the cage to open it and then click on the Unicorn again. The mother phoenix will approach and you will play a game where you must defeat it with the laser lance while riding the flying unicorn. This game can be really hard. You need to avoid the flying bugs, rocket missiles and lightning clouds. You can shoot the bugs but just get out of the way of the storm clouds and the red phoenix missiles that come at you. After a while, the mother phoenix appears. She will open her mouth and then you need to shoot a fully chargedshot from your laser lance and hit her in the head. To do a fully charged shot, click and hold your mouse button until the tip lights up green and then fire. It’s helpful to charge up your lance before she arrives each time so that you’re ready to shoot. After you shoot, get out of the way of her rocket missiles. Also, be careful because sometimes instead of appearing on the right side of the screen, she will sneak up behind you. After you hit her three times in the head with a fully charged shot from your lance, she will destruct and you will return to the green knight. He will now accompany you on your mission. Once you are back in your ship, click Launch and then press the Teleport Home button. Go to the upper right to head towards the fire planet. It is located at the coordinates 83,20. Watch out because along the way you will encounter a black hole that you must navigate around. And just like with the Jungle Planet, the area around the Fire Planet has space aliens who will attack you. Once you land on the planet, exit your rocket ship. You will be standing outside on a platform surrounded by hot lava. If you fall into you will be sent back to the starting platform. Move to the right, jumping from platform to platform. Note:it is always easier to jump to the next platform when it is moving downwards. This is especially true for the last platform. When you get to the final platform, wait for it to get to the top of the volcano and then jump off to the left. You’ll land at the top of the volcano crater and can then go down inside. Once you’re inside the volcano, you need to make your way through the caverns while avoiding the yellow steam that goes by. If you are touched by the steam, you get sent back all the way to the beginning and have to start over again. They key here is patience. There are little alcoves along the way where you can wait safely for the steam to pass. As soon as it disappears, make your move to the next safe spot. Once you get to a larger open area, the steam stops coming. But now there is a rolling rock creature that blocks you from passing. Time your jump to go over him just as he’s rolled up into a circle and you should be able to get by. Once you get past him, you’ll meet up with the Red Knight, named Sir Pellas. He will tell you that he failed and that a beast is holding the princess. He will give you an ice arrow to slay the beast. When you enter the room to the left, move quickly to the first chain and jump up and climb it to the top. Then move from chain to chain until you reach the end. Drop down and run under the dropping spike ball from the dragon’s tail. Then click on the lever to temporarily shut down the robot dragon. Move quickly to the right so that you have a clear shot to the dragon’s open mouth. Click on your ice arrow and shoot it into the dragon’s mouth. If you hit him successfully, he will turn orange and red and start jumping up and down. This will cause stalactites to start falling from the ceiling, but the dragon will stop shooting fireballs at you and his spike tail will stop working. If you move quickly enough, you can go across the chains again (just watch out for the stalactites) and get under him before he reactivates. Then just flip the lever, move, and shoot him again. Tip: after you flip the lever, don’t wait for the spinning cursor to stop. Move to the right immediately so you will have enough time to position and shoot the ice arrow before the dragon moves his mouth. Shoot the dragon three times to defeat him. Once you beat the mechanical dragon, the red knight will come into the room with you and join you on your mission. Return to your spaceship and teleport home. Head southeast to coordinates 73,83. When you arrive, you will find space sharks guarding the planet. You need to lure them into a trap. Shoot all of them to get them to follow you and then lead them to the black hole located to the north. The coordinates for the black hole are approximately 84,47. When you’re luring them away, keep them close enough to stay on-screen or they will go back to guarding the ice planet. Once the space sharks have been dealt with, you can land the ship on the Ice Planet. When you exit the ship, you’ll be standing on a platform above ice water. Just like the lava from the Fire Planet, if you fall into the water, you’ll be teleported back to your ship. Move from platform to platform while watching out for the flying robot fish. It’s a little tough to move from platform to platform and you will slide a bit because it’s ice. You should aim for the middle of each platform when jumping so that you don’t slide off when you land. In the next part, jump up on the platforms to climb the mountain while avoiding the giant snow balls. This part is much easier than the ice platforms from before. Sir Gawain, the blue knight, is standing at the very top of the mountain. Talk to him and he will give you a special force shield. You will then have to fight a giant tiger-shaped helicopter that drops snowballs on you. Using the force field, you can bounce the snowballs back at him to damage the helicopter. You need to hit him three times. From time to time, ice shards will fly towards you and they will damage your shield, so watch out. If the shield runs out it will need to recharge and you will be defenseless for a while. Just avoid everything when this happens. After you defeat the tiger helicopter, the blue knight will appear and he will join you. The Crystal Gate is an asteroid at the coordinates 11,82. You can go there once you have found all three knights. The the Crystal Gate is surrounded by an asteroid belt, so you need to be careful when you get near it. Once you land exit the space craft. Climb up the crystal mountain to the top where the 3 knights are waiting. Click on the sword that is stuck in the stone. You will open a small vortex that you can enter. You arrive at the castle of the Binary Bard. Jump down to the bottom of the castle and speak with the princess. She will ask for the three powerful weapons you have brought and then she will take them from you. But once she does, she will reveal herself as the Binary Bard in disguise! He will then laugh at you and disappear. There is a wall next to you. Click on it and it will become a puzzle. When you click on a square, it will stay the same but flip over the adjacent squares. The goal is to turn over all of the pieces. It’s a little tricky, but you should be able to do this puzzle with a little experimentation and practice. Welcome to the final battle. This is really hard and takes place in two parts. Your health meter doesn’t reset between them, so you need to do the first part as carefully as you can. In the first part, you will fly around as Merlin the robot owl. Be careful to avoid the spinning discs and Mordred’s zaps and robot arms. The goal is to pick up the black bombs that Mordred drops on the ground and then fly above him. When they start blinking red, wait a few seconds and then release them so that they explode on him. When you get two bombs on Mordred he will zap and kill Merlin. (Sob!) Goodbye, Merlin! Now comes the really hard part. Try to get Mordred close to the platform where the real princess is trapped. Then jump up on him and then up onto the platform. Stand on the edge and then do a big jump to either the left or the right. If you timed it right, you’ll land on one of the chandeliers. Now move yourself so you are in the middle. He will go underneath the chandelier and fire his laser at it. It will fall on top of him. Repeat this on the other chandelier and then you will destroy Mordred. He will emerge again but the princess will finish him off. Once that’s complete, the mission is finally over! You have rescued the princess and will receive the Astro-Knights medal. Congratulations! 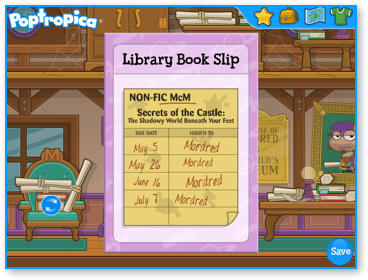 Thanks to Poptropica Tips for Poptropicans for letting us use this walkthrough! Click here to view the original!